I named this block Black Tie Event due to the colour scheme I chose. It is actually based on Doves in the Daylight by Michelle Bartholomew, a block itself based on a seven patch called Doves in the Window. For Black Tie Event, I reduced the number of seams slightly and added the tiny accent squares in the corners of the block for an extra hit of colour. 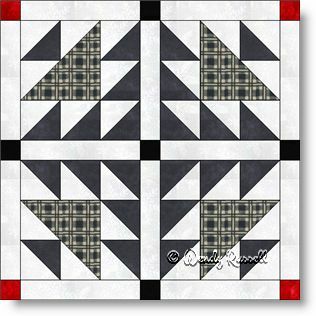 This block uses only rectangles, squares and half square triangles (in two different sizes), so it is relatively easy to construct. However, because of the large number of pieces in the block, I have assigned it to an intermediate level of difficulty. Sashing strips were added to each sample quilt illustrated which allows for a tiny bit more of the accent colour (in this case, the red) to be added to give that extra spark to the quilts.